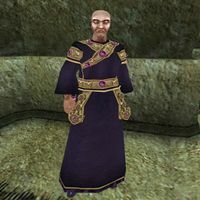 Trebonius Artorius is an Imperial battlemage, and the Arch-Mage of the Mages Guild in Vvardenfell. He is generally regarded as somewhat of a joke by the rest of the guild; while he is an outstanding Battlemage, his ability to lead the guild is somewhat lacking. This is even more apparent when one encounters the strange quests he offers (Mystery of the Dwarves and Kill the Telvanni Councilors) as well as a certain quest from Ranis Athrys about a spy in the Mages Guild. He's also the man to see if you've been expelled from the Mages Guild. Talk to him, and he'll state that you need to "reflect on what you have done". Wait about 7-14 days, then he will let you come back into the Mages Guild. His unique staff has some nasty enchantments on it. He wears an extravagant robe with matching belt and shoes as well as the necromancer's amulet. He also carries a unique potion of Cure Common Disease, five Exclusive Restore Magicka potions, an Exclusive Rising Force potion, and a Cheap Fortify Health potion. Despite his shortcomings as a leader, Trebonius has a wide array of powerful spells. Aside from his natural charm and ability to absorb Fatigue from others, he knows the following spells: Dire Weary, Great Feather, Second Barrier, Strong Fire Shield, Strong Frost Shield, Strong Shock Shield, Blood Despair, Dire Weakness to Fire, Dire Weakness to Frost, Dire Weakness to Magicka, Dire Weakness to Poison, Dire Weakness to Shock, Drain Blood, Ghost Curse, Toxic Cloud, Wild Distraction, Absorb Endurance, and Absorb Intelligence. "Greetings, %PCName. I am Arch-Mage Trebonius, Guildmaster of Vivec." "Yes, I remember you, but do you remember me? I am Arch-Mage Trebonius Artorius and head of the Guild of Mages here in Vvardenfell." "Are you here to challenge my position in the Guild? Do you think you have what it takes to be the Arch-Mage?" "Have you come to challenge me for the title of Arch-Mage?" "You have been expelled and you must make amends." "I have seen how you lust after the power and prestige that only I have as the Guildmaster here in Vvardenfell. If you truly think that you can take my place, meet me in the Arena for a duel to the death." I will meet you in the Arena. "Very well. Meet me in the Arena here in Vivec. We will settle this once and for all." "Meet me in the Arena." Nevermind. "Then you will always be known as %PCName the %PCRank." "[Tiram Gadar's Credentials has been added to your inventory.] I'm sure I have them somewhere around here. Ah, yes, here you go, %PCName. A letter from Ocato himself." "I have already given you Tiram Gadar's credentials. They should assure you that he is a Dunmer of the highest character." "Why, no, %PCRank. You've been expelled, and I really can't trust your scholarship right now." "It's a simple task, surely. Just go to some ruins and... erm... and find out what happened to them. Maybe some people here in the Mages Guild can give you some clues." [Disposition +25.] "Oh? Let me see these books, %PCRank. Oh, yes, of course. This "Egg of Time" is quite obvious... in its... um... descriptions... of the things... that happened. Yes, of course. It is all quite clear to me. I would prefer that you wrote a report that... um... simplified your findings, but I trust that you have indeed solved the mystery." "Well, I'm glad that the mystery is solved at last. Next time the Arch-Mage of Almalexia visits, I'll really have something to brag about." "Yes, of course. You've been expelled. These things take time. I believe that eventually everyone will forget about how you broke our rules." "Hmm... Duties, you say? Yes, there are several things the Mages Guild needs done. Let's see. Hmm... Find out about the disappearance of the Dwarves. Yes, that's an excellent task for you, %PCRank." "What was it I asked you to do? Oh, yes, find out about the disappearance of the Dwarves. Why not talk to Edwinna in our Ald'ruhn branch? The two of you should get along famously." "Yes, you solved our little Dwarven mystery quite easily, I'm sure. Once these recent troubles have passed, I may have more duties for you." "Yes, since you found out about the Dwarves, perhaps you could help with our other little problem: House Telvanni." "They are the enemy, %PCRank. They oppose everything the Mages Guild stands for." "Yes, House Telvanni simply does not get along well with the Mages Guild. I do not think that we can resolve this conflict peacefully. Therefore, I request that you kill the Councilors of House Telvanni: Master Aryon, Mistress Dratha, Master Gothren, Master Neloth, and Mistress Therana." [Disposition +25. Necromancer's Amulet has been added to your inventory. Trebonius' Staff has been added to your inventory.] "Ah, so all the Telvanni Councilors are dead? That is good news indeed, %PCRank. I've feared for my life working here on this island with all those Telvanni around. Now that they're gone, I don't need this amulet or this staff. They're yours now, %PCRank." "Thanks to you, things will be much more peaceful for the Mages Guild here on Vvardenfell. Perhaps there's hope for the Empire after all." "Well, of course, %PCName. We value your membership as much as any %PCRank. Reflect on your failures. Time heals all things. In a week or two you will be a %PCRank in good standing. I am certain of it." "It has been a few days since your unfortunate behavior began. But I still believe you will soon be a member in good standing once more. Perhaps in another week." "Yes, any day now the Mages Guild will review all those expelled from the ranks. If your case comes up, I will put in a good word for you." "Why, no, %PCName. There are no Telvanni spies here. And I would know if there were. I'm the Archmage [sic] after all. Tiram Gadar, my Dunmer advisor, keeps an eye out for spies and that sort of thing." "Why, no, %PCName. There are no Telvanni spies here. And I would know if there were." Lie; Ranis Athrys is a Telvanni spy. "What? I thought she hated them after what they did to her parents... But I have heard she was trying to intimidate rogue Telvanni to join the Guild. Tiram Gadar mentioned that the Dunmer are quite upset over some of her actions. I will have her expelled immediately." "It seems you found the spy, %PCRank." "You killed him, %PCName. While he was not truly a member of the guild, no one admires your actions." "He's been of immense assistance, %PCName. He helps me see the Dunmer side of every decision I make, and he came with the highest credentials." Catch a Spy: Search for a Telvanni spy who has infiltrated the Guild. A Wizard's Staff: Procure a Wizard's Staff required for the rank of Wizard. Arch-Mage: Your final quest to replace Trebonius as the guildmaster of the Mages Guild. A Rash of Insults: Cure Tarer Braryn who was cursed by Arch-Mage Trebonius Artorius. Trebonius is one of the most prominent NPCs to be affected by the Moving NPCs glitch. In patched versions of the game, a script runs repeatedly to see if he has been affected by this problem. It moves him back to his starting point if he becomes inaccessible. This page was last modified on 23 November 2018, at 06:02.